What is spherical coordinates and where are they useful? These are some of the questions I’ll answer in this blog that also contains a implementation of spherical coordinates for the Unity Game game engine. First take a step back and look at how positions usually are specified in 3D space. Positions in space are usually written in the cartesian coordinate system, where the 3 axis X, Y, and Z span the space. A point in the cartesian coordinate system can be defined using a vector (x,y,z) from the origin to the point, where x is is the distance traveled along the x axis, y is the distance traveled along the y axis and z along the z axis. The cartesian coordinate works well as the reference coordinate system. Along with the cartesian coordinate system comes a lot of useful math using vectors and matrices. Note that I have chosen to let the y axis point upwards as it does in Unity. Elevation angle and polar angles are basically the same as latitude and longitude. Note that a point specified in spherical coordinates may not be unique. 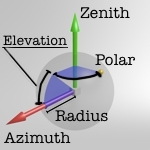 The spherical coordinate system I’ll be looking at, is the one where the zenith axis equals the Y axis and the azimuth axis equals the X axis. 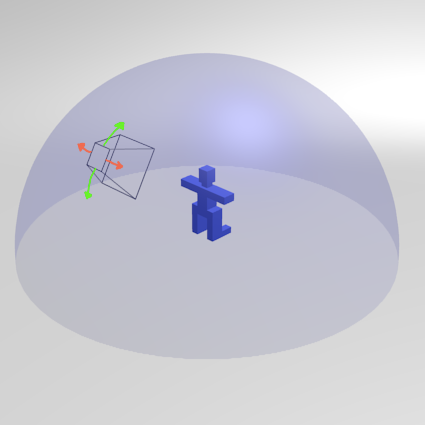 One usage of spherical coordinates is in third person chase camera systems, where the player controls both the player-character and the movement of the camera. On console games this is usually done by mapping one joystick to control player movement and another to control camera movement. The camera movement is restricted to move around the player giving – a perfect example of how to use spherical coordinates. The radius is simple the distance between the player character and the camera, the elevation angle can be mapped to the vertical joystick state and the polar angle can be mapped to the horizontal joystick state. your blog is great! thanx for sharing these knowledge. You may want to use ATan2 instead of ATan. It takes two arguments instead of one so that it can return the angle in the correct quadrant and handles cartCoords.x being zero. This avoids the need to set cartCoords.x to epsilon. and the need to adjust the returned angle.